Reading and share top 5 famous quotes and sayings about Being Displaced by famous authors and people. Browse top 5 famous quotes and sayings about Being Displaced by most favorite authors. 1. "But artists aren't the only marginalized folks controlling real estate. Think about the colonizing role that wealthy white gay men have played in communities of color; they're often the first group to gentrify poor and working-class neighborhoods. Harlem is a good example. Gays have moved in and driven up rents, as have renegade young white students, who want to be cool and hip. This is colonization, post-colonial-style. After all, the people who are "sent back" to recover the territory are always those who don't mind associating with the colored people! And it's a double bind, because some of these people could be allies. Some gay white men are proactive about racism, even while being entrepreneurial. But in the end, they take spaces, redo them, sell them for a certain amount of money, while the people who have been there are displaced. And in some cases, the people of color who are there are perceived as enemies by white newcomers." 2. 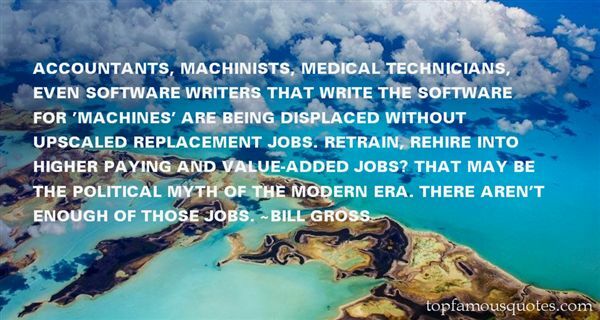 "Accountants, machinists, medical technicians, even software writers that write the software for 'machines' are being displaced without upscaled replacement jobs. Retrain, rehire into higher paying and value-added jobs? That may be the political myth of the modern era. There aren't enough of those jobs." 3. "In time, most children stop being puzzled in this way. They settle in. The world around them, as it becomes familiar and daily, becomes ordinary. 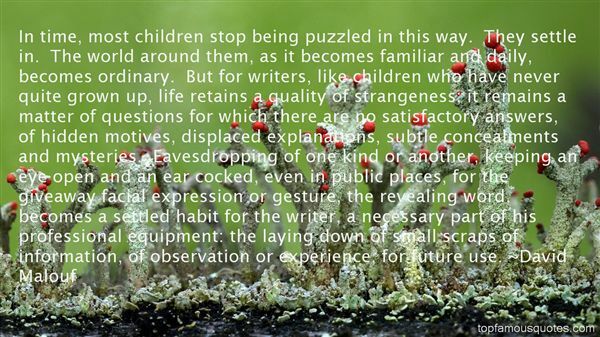 But for writers, like children who have never quite grown up, life retains a quality of strangeness; it remains a matter of questions for which there are no satisfactory answers, of hidden motives, displaced explanations, subtle concealments and mysteries. Eavesdropping of one kind or another, keeping an eye open and an ear cocked, even in public places, for the giveaway facial expression or gesture, the revealing word, becomes a settled habit for the writer, a necessary part of his professional equipment: the laying down of small scraps of information, of observation or experience, for future use." 4. "Yes, I got my first Bolex camera a few weeks after being dropped in New York by the United Nations Refugee Organization. That was on October 29th, 1949. With my brother Adolfas, we wanted to make a film about displaced persons, how one feels being uprooted from one's home." 5. "The Arabs understandably did everything they could to protect their monopoly. Coffee beans were treated before being shipped to ensure they were sterile and could not be used to seed new coffee plants; foreigners were excluded from coffee-producing areas. 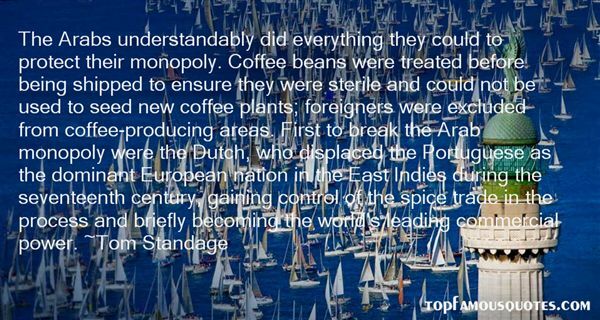 First to break the Arab monopoly were the Dutch, who displaced the Portuguese as the dominant European nation in the East Indies during the seventeenth century, gaining control of the spice trade in the process and briefly becoming the world's leading commercial power." We all have value and the right to find as much peace with ourselves and our flaws and weaknesses as possible. Why would forgiveness be so important to God if we didn't need it all the time? He knew we would need it from Him, but also from us for ourselves and for others. When we get peace with our weakest areas, we'll find new ways to build on our strongest areas."